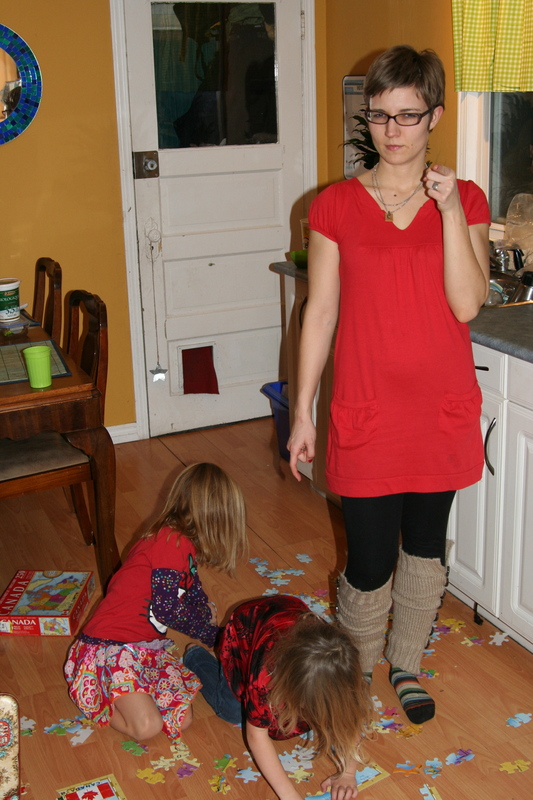 Sometimes when I have the extra two kids, I like to do theme days. 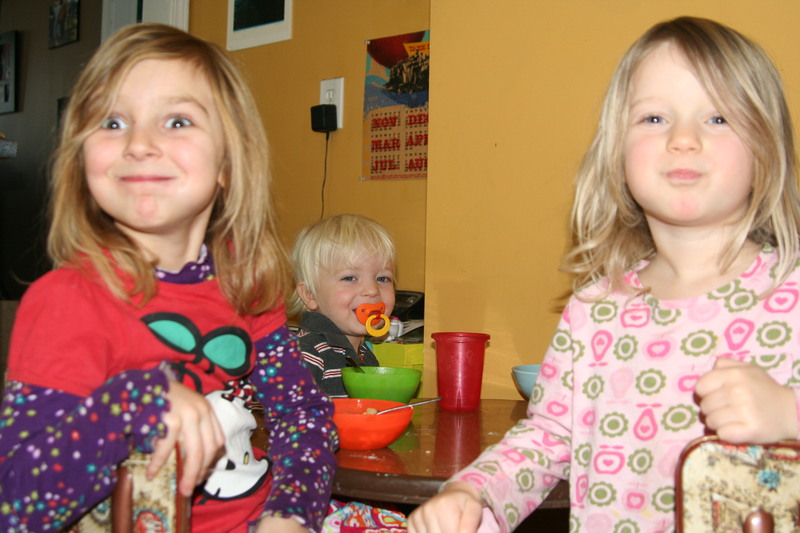 They’re fun for me to plan, because I can incorporate the meals, books, activities and crafts or experiments. Today was Soup Day! There wasn’t a lot to it, but it was fun. First, we read Stone Soup, by Ann McGovern (my copy is from the 70s or 80s and is well loved). It’s about a traveler who stops at an old woman’s house to beg for some food, only she says she has none. He says it’s fine, he has a stone that he can use to make soup. They throw it in a pot with some water and boil it, and he keeps suggesting she add more ingredients (chicken, carrots, onions, beef bones, barley) and of course they end up with delicious soup. 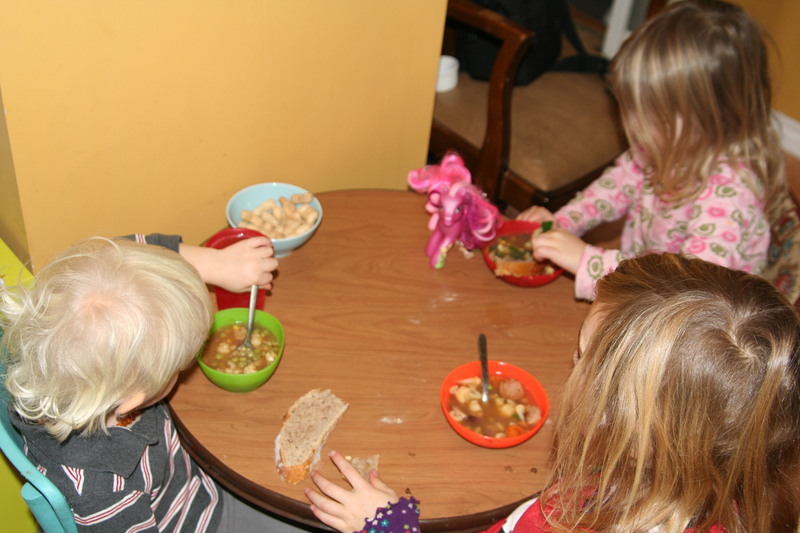 After we read the book, I took out three pots and put a clean, round stone and some chicken broth in each, then let each child choose veggies, legumes/beans, a grain and a meat to add to their own soup. 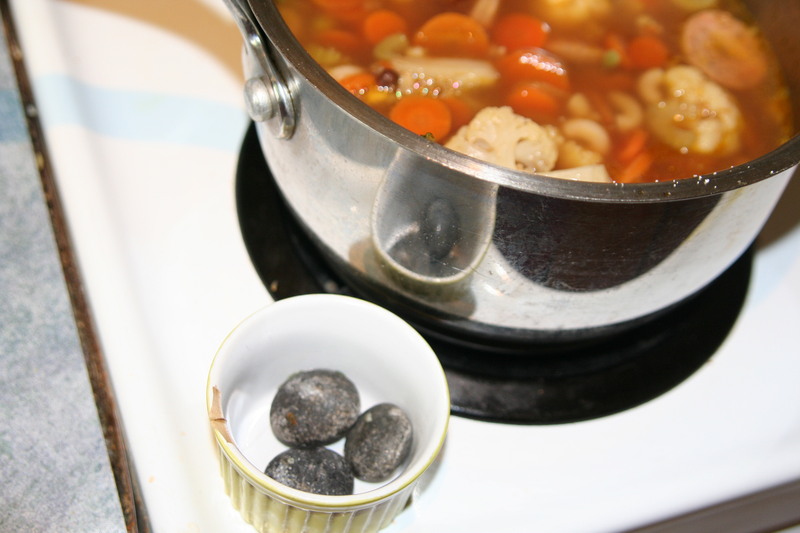 The three stones we used to make the soup. 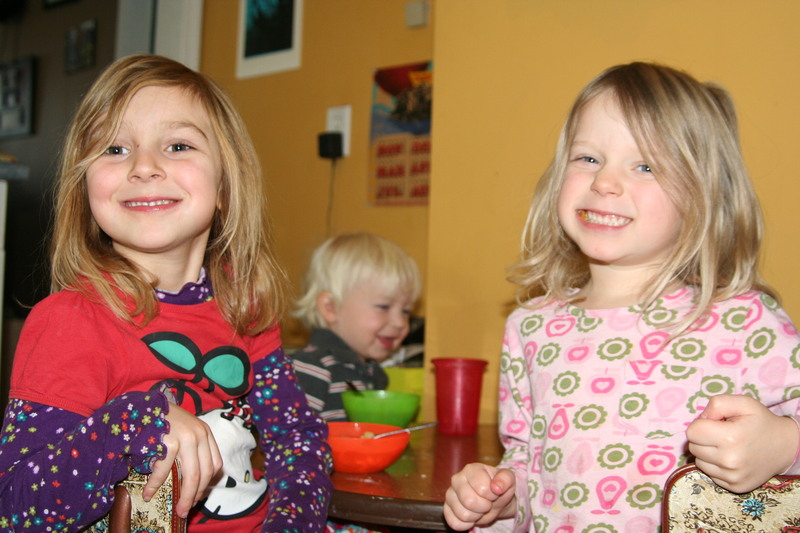 Finn only had peas, corn, cauliflower and rice in his; Mairead chose peas, corn, cauliflower, carrots, spinach, rice and chicken; and Neko wanted peas, corn, carrots, cauliflower, legumes, macaroni and sausage. I tried all three, and they were tasty! I also made some fresh bread for them to dip in their soup. 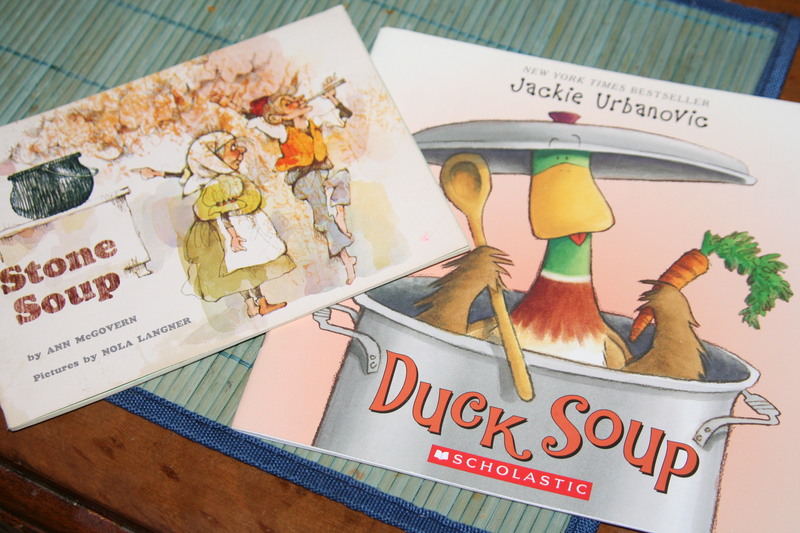 After lunch, we read another favourite – a really funny book by Jackie Urbanovic called Duck Soup. It’s about a Duck named Max who loves to cook soup, but one day, when his friends come to visit, they find a big pot of soup on the stove and think he has fallen in, so they dump it out in an attempt to save him. It’s really cute. I’m sure we could have done more for Soup Day. Does anyone out there have any ideas? Also, today was Dressember Day #8. All this time there has been the issue of trying to stay warm… today I was too warm! I was wearing tights, with wool socks and wool/silk blend long underwear overtop, then wool leg warmers, plus my dress and for much of the day, a short sleeved, hooded cardigan. 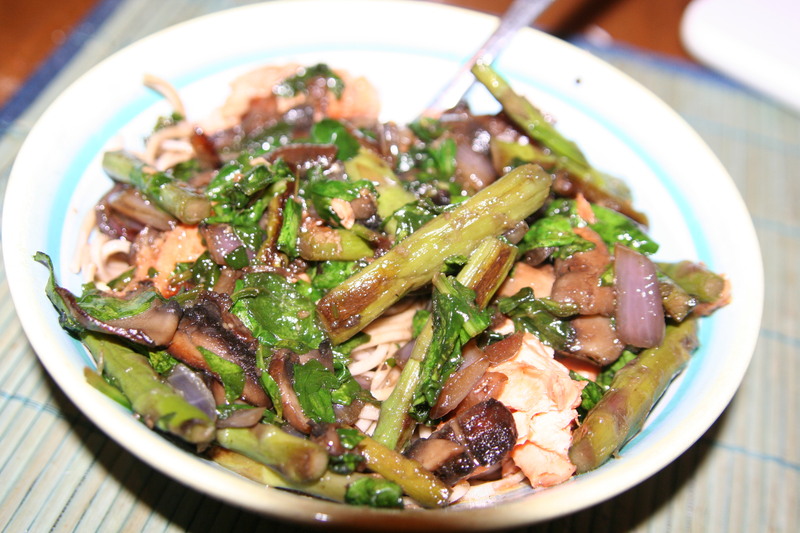 With the soup and bread cooking, I was cooking too. Great idea about them getting to choose what is in their soup… I’m going to attempt this.